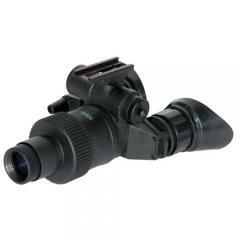 ATN NVGONVG73A NVG7-3A Night Vision Goggles FREE SHIPPING! The NVG7-3A Night Vision Goggles from ATN are versatile, low-light optics perfect for surveillance and nighttime tactical operations. Featuring the latest, third generation image intensifier tube and all glass multi-coated optics, the goggles offer superior light transference and clearer imaging than the competition. When there is absolutely zero light available, a built-in infrared projector provides the crisp, detailed vision clarity needed to read maps and technical specs with ease. Built for tactical application, the goggles come equipped with a comfort-fit head mount for hands-free operation as well as handheld use. A weather and fog-resistant construction, along with an impact absorbing exterior, allow the NVG7-3A to handle the toughest and most extreme environments the planet has to offer. Optional 3x, 5x and 8x lenses are also available to further improve the tactical functionality of these already incredible night vision goggles. ©2002-2019 CopsPlus.com: ATN NVGONVG73A NVG7-3A Night Vision Goggles FREE SHIPPING!